Michael Bay’s films have mostly generated a divided opinion of sorts, for some his films just do not make any sense irrespective of the box office outcome. While for many others he is one terrific entertainer who knows how to deliver an enjoyable summer blockbuster with great consistency. The Transformer series is mostly what we think of these days whenever his name springs up, after all he’s done 5 films in the franchise so far over the last 10 years, with just 2 other films in this period- Pain & Gain (2013) and 13 Hours: The Secret Soldiers of Benghazi (2014), both of them being modest ventures be it in terms of their budget or their box office outcome. While all 4 previous films in the franchise have gone on to make a lot of money, it’s also a fact that the films are also being panned a lot. With the India release of the latest film in the franchise, Transformers : The Last Knight being delayed by a week thanks to the release of Tubelight, verdict about the film started trickling in from overseas and the news wasn’t really positive. What surprised me was not the critical feedback, after all the previous film in the series, Transformers: Age of Extinction (2014) had also met with a similar response. But this time around while the film has continued to rake in the moolah from overseas, the U.S box office hasn’t been too welcoming, definitely the first time that the franchise is seeing such a development. Hence when the opportunity to watch a preview of the film in IMAX 3D came in I was of course looking forward to it, giving the film and the filmmaker a benefit of doubt, just in case if I did manage to get entertained after all. The film is a direct sequel to the previous film and we realize that Optimus Prime is not on Earth anymore as he’s set out in search of his creator. Most of the governments on Earth have declared the Transformers as illegal and have constituted a united Transformer Reaction Force (TRF) to eliminate the aliens. On the other hand the Autobots and Deceptions are at war, even as Optimus Prime realizes that his planet Cybertron lies destroyed and that he might have been responsible for the same. Quintessa, a Cybertronian sorceress convinces Optimus Prime to bring back an ancient artefact back from earth, the only means to rebuilding Cybertron. Strangely Megatron, the leader of the Deceptions seems to also be on the lookout for the same. Cade Yeager (Mark Wahlberg) finds himself drawn into the middle of the action unknowingly; soon getting sucked into a wild roller coaster ride across continents, deep sea and outer space. The film begins in good fashion with the tale taking us to England in 484 A.D as we see King Arthur’s wizard Merlin forging an alliance with the Knights of Iacon, a group of 12 Transformers on earth. In the Anglo Saxon war the Knights of Iacon help King Arthur’s army defeat the Saxons and end up handing over an alien staff to Merlin for safekeeping. While all of this could have easily been depicted by the use of animation, simple illustrations or even with just a voice over, Michael Bay clearly makes use of the lavish budget at his disposal and thus we see a live action version of the period story giving it an authentic touch. Credit certainly goes to Michael Bay as he ends up neatly blending a heady cocktail of mythology and sci-fi adventure. It does sound incredulous of course, but Michael Bay manages to make it look impressive enough on screen. However there’s not much to gain from a film which doesn’t manage to look beyond providing a grand visual extravaganza for the audience on screen. 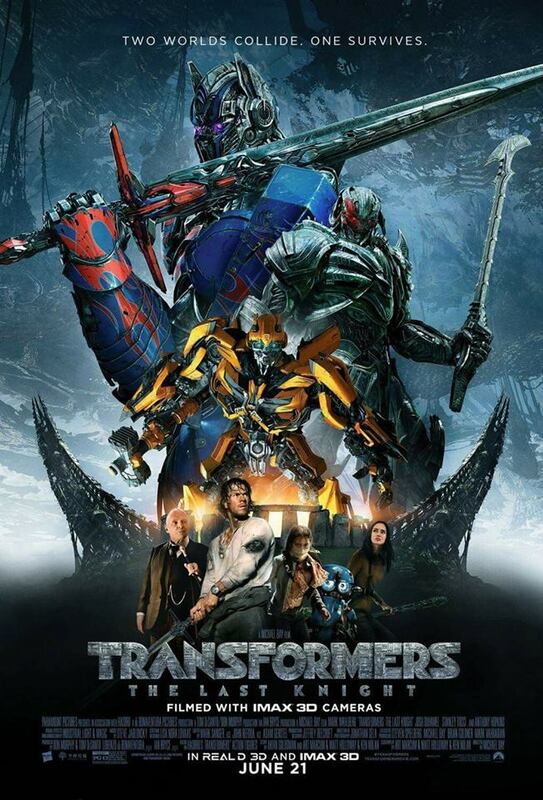 It’s also strange to see Optimus Prime being side-lined for a major part of the film, with Michael Bay relying instead on Cade Yeager and a host of new characters including Sir Edmund Burton (Anthony Hopkins), Vivianne Wembly (Laura Haddock) and Izabella (Isabella Moner). Yes Optimus Prime manages to get back into action just a little ahead of the climax but by then it’s too late to leave an impact. By the time the long drawn out climax begins one is well and truly exhausted and just waiting for the conclusion. What adds to this feeling is the run time of 154 minutes, which is fine in case if the film had a lot going in its favour. In this case beyond the visual appeal that the film has thanks especially if you are watching it in IMAX 3D there isn’t enough to keep us excited beyond a while. Some things just don’t change in the Transformers series, there are shiny new Transformers robots seen and in the garb of some fantastic car models. Characters continue to be on the run for a major part of the movie, in this case it is Izabella who does it in the first half while it is Vivianne in the second half, Cade Yeager of course doing his duty all throughout the tale. It’s nice to see Sir Anthony Hopkins have a blast playing Sir Edmund Burton, the 12th Earl of Folgan, an astronomer, historian and member of a secret society which knows the history of the Transformers on earth. It almost looks like he has told himself that so what if it’s a farce let me just play along and have some fun. Both Isablle Moner and Laura Haddock are adequate for their parts, lending good support to the proceedings and to the mission of Cade Yeager. Mark Wahlberg appears to be on auto mode here, performing his part with nonchalance as if just to say that he has had enough of the franchise. Apparently both Mark Wahlberg and Michael Bay are not keen to return back in their respective roles for the next instalment of the franchise. Am I joking by mentioning a next instalment after all that happens in the 5th film of the series? Well definitely not as a mid-credits scene more than certainly indicates that the tale is about to continue into a new direction soon. Yes that could make one shudder, but in the meanwhile unless you are a huge fan of the Transformers franchise and/or you just care to spend some cozy time at the cinemas enjoying the comfort of an IMAX 3D screen you definitely know what to do, don’t you?